Colordyne Technologies (Brookfield, Wis., USA) and LasX Europe GmbH (Langenhagen, Germany) have partnered to bring together complementary core strategies and a wide knowledge of the digital printing and finishing industries to offer stronger solutions. The companies have been working together for the past five years in the Americas market offering the 3600 Series Laser Pro which makes use of LasX’s state of the art laser die cutting solutions. This year’s Labelexpo-Europe was the first time Colordyne and LasX Europe were represented as a partnership, exhibiting in a shared stand on the show floor. Both companies have solidified efforts in the European, Middle Eastern and African markets, and in doing so have opened a shared demonstration center and sales office in Langenhagen, Germany, just north of Hannover. The new demonstration center and sales office will showcase the Colordyne 3600 Series Sprint and LasX’s Matrix digital label finishing system, and will serve as an outlet for customers to experience the technology firsthand and understand the value of digital printing and finishing offered by Colordyne and LasX Europe. “We are excited to be able to serve as home base for Colordyne’s EMEA outreach and look forward to mutually beneficial growth within the market with such a reliable and quality product line combination,” said Dirk Stüenkel, managing director, LasX Europe. Please join in the opening of the new Solutions Center on 11-13 November 2015 for a New Partnership Open House at the new location: Bohlenweg 8, 30853 Langenhagen, Germany. The Open House will be complete with live demonstrations of the Colordyne 3600 Series Sprint Digital Printing Press and the LasX Matrix Modular Finishing System. 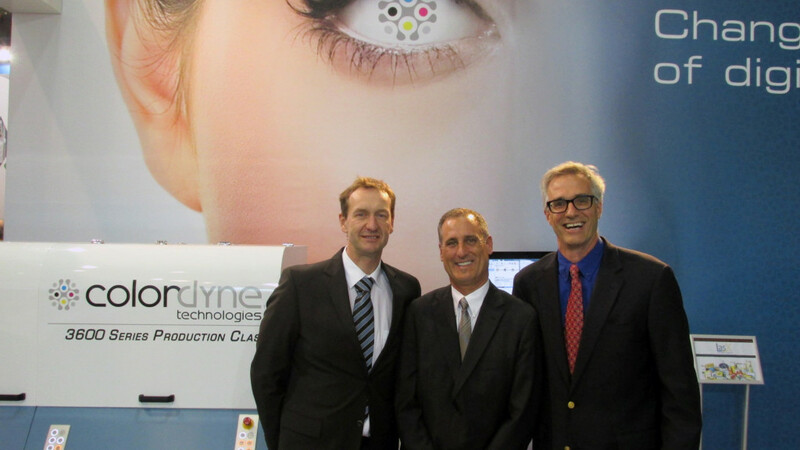 Left to right: Dirk Stüenkel, managing director, LasX Europe, Gary Falconbridge, president, Colordyne Technologies, and William Dinauer, CEO, LasX Industries together in front of the Colordyne 3600 Series Sprint at the shared Colordyne/LasX stand at Labelexpo-Europe 2015.